"cubes in spheres make lines in minds"
The formerly most famous man in the solar system, now a drug-addled mess, finds himself on the run wanted for murders he didn't commit with hidden powers at work on a plan to take control of the whole of humankind will stop at nothing to steal his most valuable asset, his imagination. Weird Lightning has not been tagged yet. Help others find Weird Lightning by tagging it! 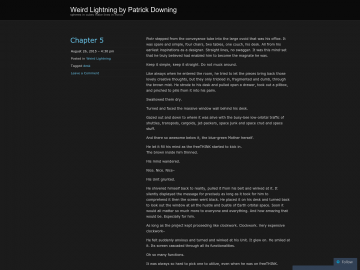 Weird Lightning has not been reviewed yet. Weird Lightning has not been recommended yet.